Many wine lovers from all over the world, including Florida, dream of having their own wine cellar at home for easy access of wine, proper wine storage, entertainment, and additional home value. In order to achieve the desired look and ambiance in your wine cellar, all your wine storage needs, requirements and personal preferences must be discussed carefully with your chosen wine cellar designer and builder. The end result will be a wine cellar with exquisite design that you can show off to your guests and a place where your prized wines can have the environment they need for proper maturation. 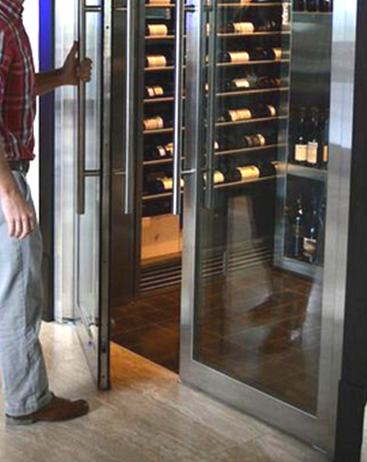 There are many wine lovers who want to have a wine cellar with a contemporary design to complement their modern home. Others who have a traditional home want to add some modern features in it. Let’s take a look at one of the custom wine cellars designed and built in Florida by Wine Cellar International, a respected company in the wine cellar industry. The client of Wine Cellar International is a resident of Northbay Road in Miami Beach, Florida. The newly-renovated home is in a picturesque setting and is beautiful and spacious. The living room and entertainment area is simple, yet elegant. Close to it is a room that was already designated for a wine cellar prior to the build out. What the client wanted was to have a modern feature in his residential space. The wine racks, wine cellar door, and flooring were designed to suit their client’s custom preferences. Wine Cellar International chose a lighting system that would accentuate the client’s wine storage space attractively. Let’s discuss the features incorporated to make this wine cellar a state-of-the-art creation and a stellar home for the client’s prized wines. The entryway of your wine cellar should be properly installed and must be made of the right materials to ensure that cool air doesn’t escape the wine room and warm air doesn’t get in from the outside. This means that the door of your wine room must be installed properly to perform its main function: to help the wine cooling unit stabilize the temperature and humidity levels essential for the graceful aging of wine. There are proper techniques used to create a seal in the doorway of your wine cellar. In this project, Wine Cellar International used dual paned glass with a custom-brushed stainless steel frame, and installed inset gaskets all around the entryway to keep an airtight seal. The advantage of a glass wine cellar door is that it provides the owner the best view of his collection from the outside. Stainless steel has been a widely-used material for making kitchenware and appliances. Nowadays, it has also become popular in wine cellar construction. The good thing about stainless steel is its resistance to rust and corrosion. A film of chromium oxide formed over the surface of this metal alloy (during air exposure), shields it from rusting. Stainless steel is also non-reactive and cannot be scratched easily. These are the reasons why the client opted for this material not only for his wine cellar door, but also for his wine racks. Your wine racking is another important component of a wine cellar that needs to be given keen attention. With several styles and types of wine racks in the market today, it is wise to seek the help of a professional when it comes to determining the most suitable racks for your space. Make sure that you choose wine racks that can cradle the different types of wines and sizes of bottles in your collection. Also, see to it that the wine rack material and design will complement the existing décor or ambiance in your home. 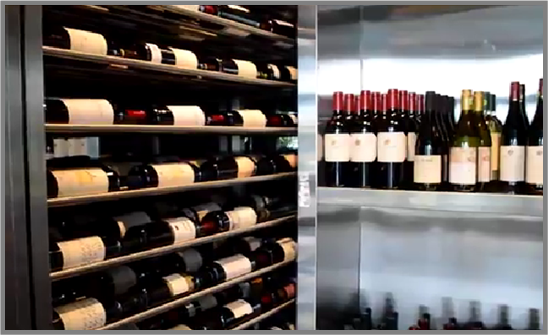 Wine Cellar International utilized custom-designed, brushed stainless steel metal wine racks for this contemporary residential wine cellar in Florida. These wine racks are ideal for long-term storage because of their ability to maintain their appearance and quality for a longer time, especially in a humid place such as the wine cellar. The left, right, and back walls of the wine room were installed with stainless steel wine racks, built from floor to sealing to maximize storage space. The wine rack orientation on the left and right walls was horizontal, to keep the cork in the bottles moist all the time. Cork that has dried up will become brittle, losing its ability to seal a bottle. If this happens, wine will be oxidized and becomes undrinkable. The lower portion of the left and right wine racking was designed with case storage bins to accommodate wines in bulk. This also added some effective design element to the wine room. The racking design on the back wall included bin and bulk storage where the owner displayed the different wine varieties and bottle sizes (splits, 750ml, magnums, etc.) in a more utilitarian look. Adding more bottles in the future won’t be difficult for the owner because the wine rack design maximized the space of the room. 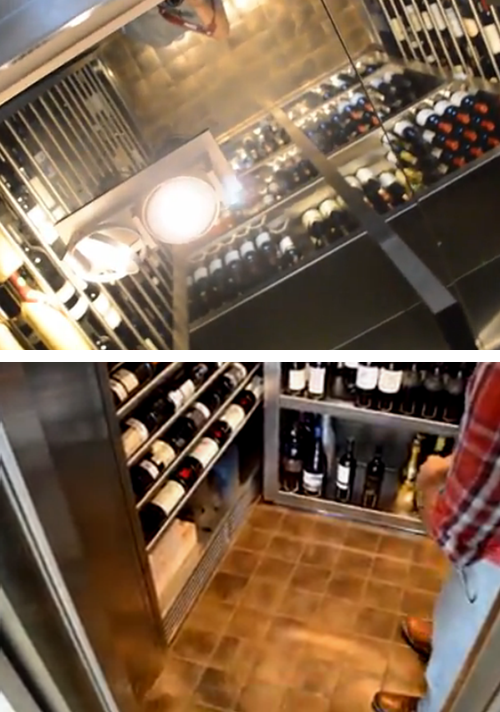 More impressive features in this wine cellar were incorporated into the ceiling and flooring. 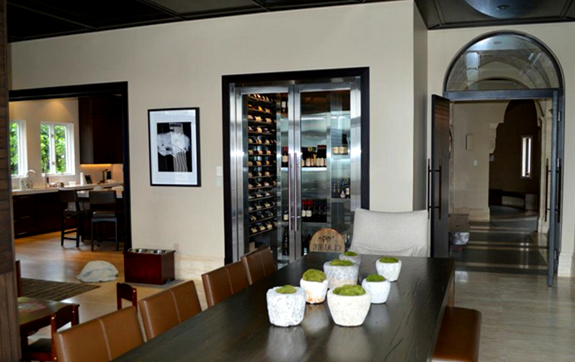 The ceiling was made of double-smoked, highly-reflective mirror, creating an illusion of more space in the wine room. The brown flooring looks great. It is eco-friendly and made of recycled tiled metal. Metal flooring is known for its flexibility and durability. It is also easy to clean and maintain. Illuminating your wine cellar takes careful consideration. Wine is very sensitive to light, so your wine cellar lighting must emit minimal heat. Achieving proper lighting while creating an aesthetic appeal was achieved by using overhead LED lighting. LED lights do not generate UV rays which are harmful to wine. These also provide soft illumination, just enough to highlight the owner’s prized wines and allow easy readability of wine labels. 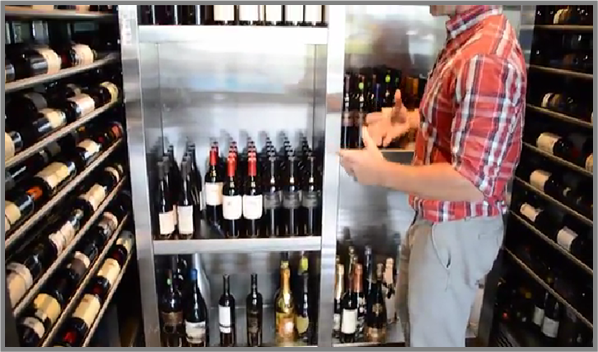 The overhead lighting can be directed to specific bottles housed in the stainless steel wine racks. 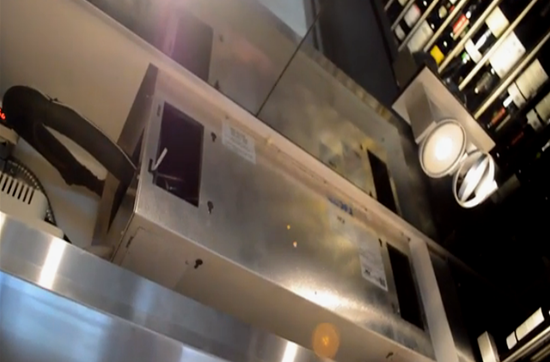 It created an impressive wash down effect on specific areas of the wine racking. Wine Cellar International also added some accent lighting to the floor. When all the lights in the wine cellar are turned on, you will see a dramatically stunning wine storage display. 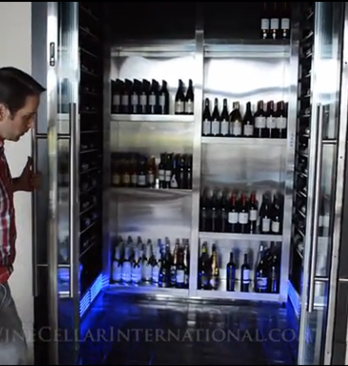 LED lighting is used by many wine cellar builders because it provides many interesting and unique ways to show off your collection. 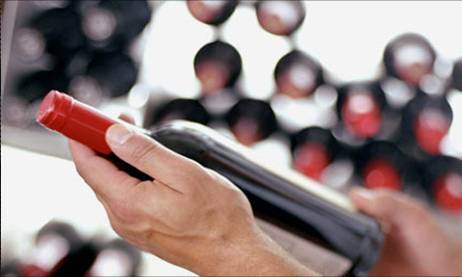 To ensure that the ideal conditions are met in a wine cellar, an efficient wine cellar refrigeration system must be installed. The high-performance RM Series split cooling system from US Cellar Systems was used in this project. This option eliminates noise in the wine cellar since the condenser, which produces noise, was placed outdoors. The space allotted for the air handler, or evaporator, was above the wine cellar door. Beside it is a thermostat that indicates the temperature and humidity in the wine room. Wine cellar refrigeration is a crucial factor when building a wine cellar, thus an expert must be consulted to protect your investment. This residential custom wine cellar is one of the remarkable projects of Wine cellar International, showing their true passion in wine cellar design and construction. 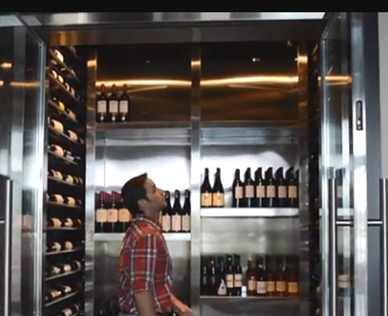 For more details about this wine cellar project, watch the video below. 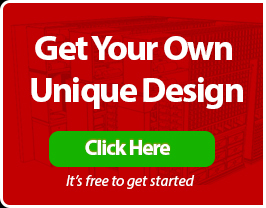 If you’re considering building your own unique and fully-customized wine room according to your budget and requirements, contact Wine Cellar International at +1 (954) 630-5866 or click here to request a FREE wine cellar design today!